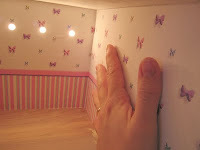 Here is a step by step guide to putting wallpaper in your doll house. 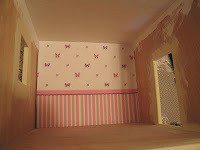 Our dollhouses are straight and easy to put wallpaper in. 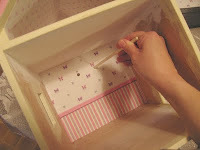 If you are making an intricate dollhouse from a kit, it is much easier to do as much painting and wallpapering as possible before assembling it and then touch up afterwards. Step 1: Print or buy your wallpaper! 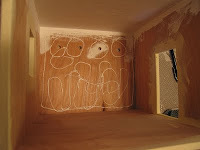 Step 5: Doodle some glue around the wall, paying special attention to corners and openings as these are the most important parts to have securely glued. I have found with the medium weight paper I use for wallpaper that you do need a thin layer of glue covering the entire wall. Otherwise bubbles in the paper appear. Some people prefer cardstock wallpaper and only a little glue on the edges. It's your choice. Keep in mind how you will hang pictures... since I usually use Velcro so that the pictures are moveable, the wallpaper needs to be securely fastened to the wall. This is messy, so don't be afraid to get messy! Just smear two or three or four fingers around in the glue! 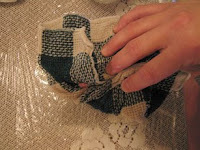 Step 6: I like to keep a damp rag nearby to wipe off gluey fingers. You do NOT want to smooth out your wallpaper with wet or gluey fingers, so make sure they're dry before going on to the next step. 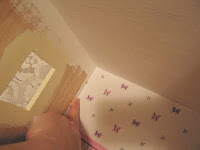 Step 7: Place wallpaper on the glue... start with one corner and smooth it out towards the other corner. 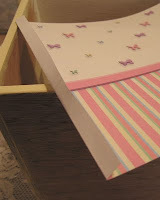 Press firmly up and down the corners to get a good crease. Rub gently all over the entire wall to ensure a smooth bond. 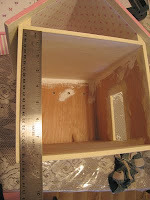 Step 8: If you are decorating a house with holes for lights drilled in the back, poke through them with a dowel or pencil. Usually there is enough glue around the holes to keep the poked in part glued in place. 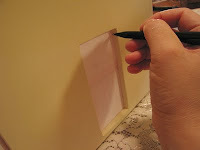 Step 9: To make a space for a door or window, place your measured piece of wallpaper in the house, hold your hand flat on one side (or use a book) and on the other side, trace the outline with a pencil. Step 10: Cut out the opening and repeat above steps to glue the dollshouse wallpaper, again paying special attention to the edges... they are what will receive the most wear in a played with doll house. 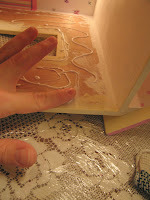 I usually lay one finger flat and smear the glue towards and slightly over the edge. 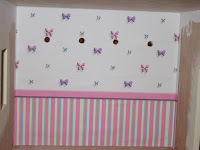 I created a separate post for installing partial walls of wallpaper. I'm totally inspired by your work... you did a wonderful dollhouse! Thanks! Your post are so helpful....thanks so much ! 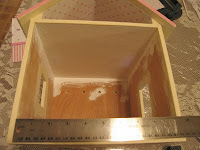 This site is really helpful for me as I begin to figure out how restore a doll house. Thanks for taking the time to share your knowledge. I was just going to give up and wallpaper two walls, then paint the other walls, because of an odd corner. Now I know to wait until it's built and wallpaper around the corner. This is a much better solution. Thank you! Thanks so much for all the great information. I have just acquired a doll house this year so am new at all of it. Thanks so much for such an amazing blog! I'm trying to redo my childhood wooden playhouse for my daughter (it's been under my parents house for nearly 25 years!). It's got some mold etc on it and some really tight corners and stairs I have no idea how to get to!! I've stripped it back (pulled off wallpaper, felt carpet etc) - but am at a loss of what to do next. Do I have to sand all the paint off (was under the old wallpaper) before rewallpapering? 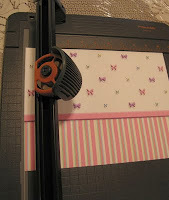 And can you print the printable wall papers on normal printer paper or should you use special paper? Thanks again so much! It sounds like a fun project! Q-tips or a wodden pencil with its lead brokn out work to get in tight corners. If you are going to wallpaper, just make sure the surface is smooth enough not to show major bumps... it would not need to be perfectly smooth if you use a heavy paper to print your wallpaper. Not sure about the mold... if you could sand it out, that would be good. If it won't sand out, at least give it a coat of Kilz Paint Primer to preven the mold from continuing to grow (or to grow through your freshly repainted/papered work). The printable wall papers can be printed on whichever type of paper you prefer. I've tried everything from regular printer paper, to a heavy "matte everyday photo paper" type of paper, to card stock. I prefer the "matte everyday photo paper" as it's a good weight and easy to work with. (heavier than regular printer paper, but not so stiff as cardstock). Sorry it took me so long to post yours and answer. I was away from home for a few days! Good luck!